In the history of the early church, this is the second missionary trip of Paul and his apostolic trip. On the first trip, Paul and Barnabas, finished their work and went back to Antioch. In Acts 16, Paul has a dream and God speaks to him. he sees a man from Macedonia beckoning him to come. So they decide to go there together. They first go to Philippi where they are beaten and imprisoned. From there they came to Thessalonica. The people in Thessalonica speak about Paul and his team as men who have turned the world upside down. I want us to do that too. I want Regions Beyond to be a partnership that turns the world upside down. That is what we are called to. All that’s gone before is that we might be a people who do this. An Anglican bishop once said, I notice that when I read the New Testament, wherever Paul went, there was a riot. But wherever I go, we have a cup of tea. I want us to be a people who have chai, but I also want us to be a people who have the same impact as Paul did. Wherever we have churches, we should be turning the world upside down. 1. They make a plan- we are a people of the spirit. We need the power of the spirit. But we also need to make plans. We make plans in this context. When the man from Macedonia appears in the dream, they first go to Philippi, which is the leading cities in the regions. They went to places where people are, where markets are. And the gospel went out through the whole area. When Paul writes to the church in Rome. He says I am coming to you so you can help me go on to Spain. That’s a crazy thing to say. There were still town villages and cities where churches have not yet been planted. But, his work was done because he planted churches who understand that the reason they are there is to take the gospel to the places around them. In Acts 20- Paul’s team, whom we don’t hear much about. But there are people from Thessalonica in that team. He knows where to go and what he’s going to do once he gets there. He is pulling together a group of people, who are going to take the good news to the surrounding districts. We need to make some plans. Not just wait for words to fall out of the sky. Every town and city needs the gospel. It needs churches that know to take the gospel around. What are your plans? If you haven’t got a plan, you’re just waiting for something to happen. Some of your neighbours, are waiting for you to make a plan. Think, who is around me? It starts with praying, but it cannot end in praying. If someone asks you why you believe in Jesus, can you give them an answer in 2 mins? If you love the Lord Jesus, you should be able to give a short answer. Work on it if you can’t do it. When they ask why, they are not asking how you believe in Jesus. We must plan as churches. 2. We have a message of Good news: this is why we’re here. We should not need mission agencies. This nation is full of them. Jesus’ mission agency is the local church. If we’ve been doing the job that God has called us to do, there would be no room for mission agencies. We’ve been called to take the message of Jesus Christ. Paul goes to the city, a synagogue and start telling the Jews that the messiah they are waiting for has already come. That is our job too. If you are breathing, you have to be someone who takes the gospel to people who do not know him. We are doing some remarkable things. There are outreach activities, and it is great. But what we are doing- care for the sick and educate those who know it- others can do it as well if not better than us. They, however, cannot share the gospel. What are Paul and his team doing? He never reaches out to lepers (he just heals them) and sets up a school, they preach the good news. It is not just for leaders and evangelists. The main role of an evangelist is to spur us to do it. The word of the Lord to everyone is- do the work of an evangelist. 3. We do it by planting churches. The most effective way of seeing people saved is to plant churches. We send people to different places, we plant churches. We are not going to do anything else. Everything we do should lead us to plant churches. To families- Think about people in your family or friends, who do not believe, or believe in other gods. Practice sharing the gospel with them, make plans to do it and trust that God can use you to save them. 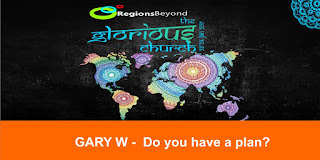 To churches- there are 1 Billion people in this nation. It’s a massive task, but praise God we are not being asked to do it on our own. Do not be overwhelmed by the size of the task but there is work to be done. I want to speak to you, you need to make some plans. We must plan about how we are going to have impact. We cannot just sit in meetings hoping people will come. We have to train one another. I’m tired of this world, I want the end to come and Jesus said that the gospel of the kingdom will be preached in every nation, every people group, and then the end will come. There are 100s of unreached people groups in this very nation.